I’ve lived in New England most of my life (with short stints in New York and California). I’ve been in New Hampshire almost long enough—35 years—to be considered a local. My favorite kinds of books are fiction and vegetarian/vegan cookbooks. I’m also moderately knowledgeable about baseball. A beautiful story of a man struggling to find himself while trying to rescue an elderly dog who does not want to be rescued. Don't be fooled by the cover - it is anything but cute. People who love nature and wildlife. People who want to simplify their lives and get back to basics. If you haven't yet read Following Atticus, start there. Get to know Tom and Atticus before you meet Will. It's a quirky little book. It's a love story. It's about parents, children, and family bonds. It's about misfits struggling to fit in. It's about loving each other, warts and all, honoring our true selves and our damaged souls. It's about evil corporations and ethical dilemmas. Oh, and it's about squirrels. Did you know that they used to migrate in huge herds by the millions? Fans of British TV's "One Foot in the Grave" will recognize Ove as a Swedish Victor Meldrew. Descibed as the "grumpiest man you will ever meet", Ove gives new meaning to the term curmudgeon. He has always been a bit of a grump, but since the loss of his wife he cannot bear companionship (human or other). When new neighbors move in next door, Ove's life changes despite his best resistance. The book is hysterically funny, poignant and big-hearted. I loved it! Jodi's newest is a fascinating story with something for just about everyone. Jenna Metcalf is a 13 year old girl whose mother Alice (a scientist studying grief in elephants) disappeared 10 years previously. Refusing to accept that her mother is dead, Jenna convinces a washed-up detective and a disgraced psychic to help in her search. Loaded with amazing information about elephants, the book is a great story, a mystery with elements of the supernatural, and a moving exploration of the mother-daughter bond. The ending provides a twist that I did not see coming. very enjoyable! Fans of Jan Karon's Mitford series will rejoice! After swearing that the series had been wrapped up after book #9 (Light From Heaven), Jan is back with book #10. Father Tim Kavanagh has been retired as rector of Lord's Chapel for 5 years. After journeys to his childhood home of Holly Springs, Mississippi, and to Ireland, land of his ancestors, Father Tim is back in Mitford and a bit at loose ends. How he resolves his ennui, helped by a familiar cast of Mitford's colorful characters, and enters the next phase of his life, makes for a very satisfying story. Jan's many fans will enjoy the latest adventure. (Note: if you are not familiar with the series, I recommend starting at the beginning, At Home in Mitford). In this profoundly moving book, Ms. Bradley follows a particular elephant named Billie from her childhood capture through many years of performing for zoos and circuses to - finally - the chance to live her remaining years at a sanctuary in Tennessee. The book is a history of elephant captivity and is truly a heartbreaking eye-opener. Anybody who loves and admires animals (particularly elephants) should read this book. Alice Hoffman's darkest fairy tale yet. Set in New York City (Brooklyn/Coney Island) at the turn of the 20th century, the setting is a "museum" of bizarre oddities (2-headed goat, 100 yr old tortoise, etc.) with a sideshow of the wolfman, the fire-eater, etc. The 2 main characters are a young Jewish photographer who has forsaken his heritage, and a young girl with webbed fingers who has been made into an erstwhile mermaid by her unscrupulous guardian. It has elements of The Night Circus (young woman exploited by her evil father), the Brothers Grimm, and Dennis Lehane (labor unrest and a corrupt government). It's a great love story. Love conquers evil. I loved it! Finally, American fans of the Harry Hole series are able to read the first book in the series, just published in English. Harry, our intrepid (sort of) Norwegian detective, has been sent to Australia to investigate the murder of a young Norwegian woman. The story is captivating, we learn more of Harry's back story, and as a bonus we learn a lot about Australia, especially relations between the white invaders and the Aboriginal people. It's a great read. Nesbo fans shouldn't miss it, and if you have not yet read him, this would be a good place to start. Cathie's first novel in some years takes us back to the tiny town of Mattagash, ME., way up north near the Canadian border. The wait was worth it - the novel is warm, poignant, and funny. All of the characters are richly drawn, believable, and compelling. These are people that every rural dweller knows - Harry, the Vietnam vet who is unable to talk about his war experience, even to his beloved wife; Billy, the drug dealer who is hiding out from some very bad men in Portland; Edna, bored with her marriage and yearning for something more; and many others. I frequently found myself laughing out loud on one page and sniffling on the next, from Orville the mailman's unpleasant encounter with Harry's moose mailbox to the happy ending (happy for most, anyway). I highly recommend the book. 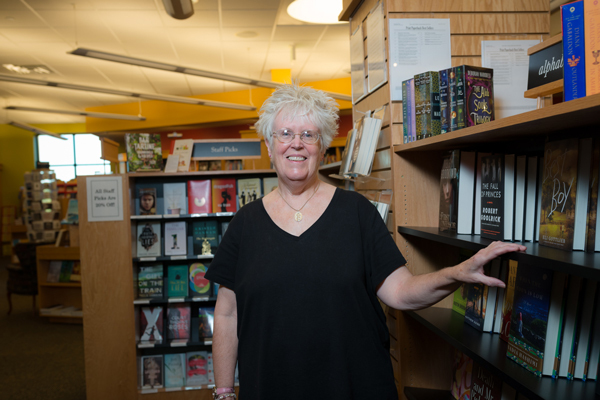 Read it now, then come to Gibsons and meet Cathie on May 17. Jodi's latest is quite a departure from her usual formula. Rather than a straight narrative, it consists of a story within a story within a story. The novel begins with a scarred and emotionally frail young woman, afraid to let anyone in, meeting and befriending an elderly man who turns out to be a former Nazi death camp commandant.Hhe has a request for the young woman - he wants her to help him die. When she discovers his true identity, she is conflicted - her grandmother is a holocaust survivor. Does he desreve to die on his own terms? Should she help him, or turn him in? We move from this premise to the grandmother's death camp story (warning - this part of the book is extremely graphic). Oh, and there is also a vampire story - a metaphorical tale that the grandmother wrote while imprisoned in the death camp. Some of the transitions from story to story felt a little clunky, but on the whole I liked the book. Perhaps she tried to do a bit too much, but the transitions make the book unique and provide different perspectives of a horrific time in history (while showing how the experience resonates from generation to generation). I recommend the book, but be prepared for something more than a light domestic entertainment. A must read for every Red Sox fan, this book covers Tito's entire Red Sox career (and gives some background on his career as a player and as manager of the Phillies), putting greatest focus on his last not-so-happy years as Sox manager. Although the book doesn't dish as much as I'd hoped, it does shed some enlightenment on the behind-closed-doors shenanigans that led to his departure. We learn about Tito's feelings toward his former employers, some of the Yankees (great respect for Joe Torre and Derek Jeter, not so much for Joe Girardi), and for some of his former players (Manny anecdotes abound, some very entertaining). I'd recommend it to any Red Sox fan (although be warned - much of the language is not kid-appropriate). It's fun, a quick read, and sheds some light on the franchise's downfall. For all Fans of Chocolat (Harris' best seller, also made into an Oscar-nomianted film), Peaches for Father Francis brings us to modern times in the little village of Lansquenet. Vianne is summoned back to the village by a mysterious letter requesting her help. She finds the village quite changed - there is now an established Muslim community, and a great deal of tension between the immigrants and the old school villagers. It's a good story for fans of magical realism as Vianne works her magic, and there is redemption for many characters, particularly the notorious sourpuss Father Francis, who finds himself changing despite his seemingly entrenched personality. Verdict: a good read from a beloved author. Because the publisher did not release advance copies, no one was able to review the book before its release, so I knew nothing about it. Although I did know it would be nothing like Harry Potter, I relied on the quality of that series in picking up her first novel for adults, and I was not disappointed. I loved it! The story is terrific - in a small English town, a member of the town council has suddenly died, and there is a scramble to fill his place. As characters are introduced we become aware of the deep divisions in the town (political and otherwise) and how many secrets are kept. Her characters are wonderfully, richly drawn, and very human (no Harry Potter-type heroes here), so true to life that you feel you know them. Several teenagers are prominent characters, so I recommend the book to young adults as well. I couldn't put the book down. It's compelling, funny, and heartbreaking, an explication of human nature and motivation, and just a great read! P.S., my co-worker Ryan is about halfway through and loves it too. In the wake of WWI, Tom, a young soldier, takes a post as a lighthouse keeper on a small island off the west coast of Australia. He is a gentle soul who carries unresolved guilt from his actions during the war and craves solitude, but when he falls in love with a local girl and marries, his life seems complete.Unfortunately their attempts to start a family end in tragedy - after several miscarriages, his wife Isabel is devastated and barely functioning. One day, after a recent miscarriage, a rowboat washes ashore carrying a dead man and a tiny (but very much alive) baby. Isabel believes that God sent the child to them and talks Tom into keeping her as their own, with devastating unforeseen consequences as truths are revealed. The book raises many thought-provoking questions and would be a great choice for book group discussion, especially poignant to women who are mothers but geared towards all adult (or even some young adult) readers. It stays with you. This lovely, lyrical YA - Adult crossover novel is a coming-of-age story with a twist: in the not too distant future, the earth's rotation has begun to slow, leading to longer days and eventual global catastrophic consequences. Our protaganist is an 11 year old California girl coping with the usual pre-adolescent crises - alienated parents, betrayal by friends, a newfound interest in boys - when suddenly (scientists can't explain why, there are many theories) the earth slows its rotation. The changes are gradual - the birds start to die, then the plants. People get sick. Populations panic. It sounds extremely unpleasant to read, and yet the writing is so lyrical, and the characters so compelling. I couldn't put it down. It's heartbreaking but sweet (as my co-worker Heather says). I highly recommend it. Father and son write about the same events from different perspectives, with a particular focus on the filming of The Way, Emilio's film starring Martin as a modern day pilgrim walking the Camino de Santiago in Spain. For those who loved the film (like me), the background makes for fascinating reading. As a young family, the Sheen-Estevez clan all traveled with Martin on location. Of particular interest is the section on the making of Apocalypse Now, and the excesses/craziness of just about everyone involved. Emilio, at the tender age of 14, was left to his own devices and spent most of his time frequenting bars and bordellos. Martin was so stressed and character-driven, he suffered a heart attack during the filming (altho he was only in his 30s) and nearly had a nervous breakdown. There are entertaining vignettes about Dennis Hopper, Marlon Brando, et.al. I have belatedly discovered the novels of Jo Nesbo, amazingly suspenseful, intelligent and addictive. Nesbo has been called the Norwegian Stieg Larsson, and is considered by many to be a better writer than Larsson. His detective, Harry Hole, is an alcoholic chain smoker who struggles to survive the Scandinavian winters. The story line continues from book to book (which can be frustrating as not all have been published in the US). The plots are complex and very suspenseful, indeed unputdownable. Start with Redbreast, and walk the grim streets of Oslo with Harry. I choose Howard Frank Mosher's new one, Great Northern Express. Non-fiction (mostly), it's about a western book tour road trip he took after completing radiation treatment for prostate cancer. He mixes stories from the trip with tales of his first years as a school teacher in the northeast kingdom. He has a wonderful self-deprecating sense of humor and parts are laugh-out-loud funny. It's also heartwarming and just plain fun. In King's latest tome, his protagonist travels back in time to thwart Lee Harvey Oswald, thereby preventing not just Kennedy's assassination but also escalation of the Vietnam War and myriad other ills. Jake Epping discovers to his surprise that he doesn't want to return to 2011, in spite of the horrible deeds he's called upon to do in 1958-63. It's a great read - a compelling story, the usual fun King pop culture references, and above all a bittersweet meditation on the nature of love.